It's a case of what's good for the goose is good for the gander. Dominica's six time Calypso King Dennison "Dice" Joseph said he is seeking answers as to the reason why he at the time a three time king was not given a bye to go to the quarter finals but a first runner up is. 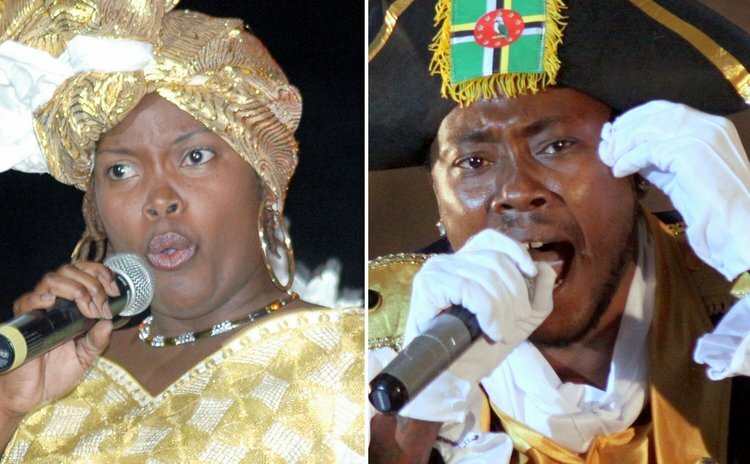 On Wednesday, the airwaves were bombarded with the calypso controversy since the Dominica Calypso Association (DCA) recently gave the green light to Sandy, who lives in the United States, to bypass the eliminations and head straight to the semi-finals. Calypsonian and executive of the DCA, Derrick "De Hunter" St. Rose said that it was not the first time that the executive has taken such a decision. "Yes, I has happened before, we did this for Tranada who is a former King, and because he lives in the US and it was really hectic and expensive to be in Dominica for all the shows, we gave him a bi and he won the crown on two occasions, I think, so we figure out that he was at a certain level. So he didn't have to go through that process." Hunter said. He said the DCA gave Sandy the go-ahead since "we figure out that seeing that she was the "calypso queen" of Dominica, she didn't win the crown, but she came out first runner up. She reached the highest peak so we gave her that concession." But Dice is hearing none of it, since according to him, when it was his turn he received a lot of pressure and he received no consideration. "People say I not bigger than the art form, nobody never consider and say, 'ok, he was the King three times already, so let's just, let us just make him go in quarters', but now I just seeing people just jumping in and they were not even king, and I just checking if somebody supposed to get a bye it's supposed to be the king," Dice said. Speaking on the issue Hunter said that King Dice was in Dominica and he did perform at the eliminations and later decided that he was out of the competition. "He find it maybe humiliating, for his level to go through it, but I went through it as well, Daddy Chess, Observer went through it. For me it was humiliating given my standard and representing the country everywhere, but it's the rule we have to conform to the rule. It doesn't matter how big, how great you are, this is the rule, and you have to conform to the rule, unless that change," Hunter said. He said he would like to see a former calypso king go straight to semi-finals because that person has a certain standard. "It's nothing about doh like and who like has nothing to do with that. It was an executive decision. We can make rules to suit, and it's at the discretion of the association. That's how it works," Hunter said. But King Dice said that when his situation presented itself an "executive decision" should have been taken as well. "I was abroad, I was in Guadeloupe for the longest while, so you trying and say any body that is living abroad and was already first runner up but not king, they can give them a bye for that?, " he asked. "The point is I have no problem with that; if somebody can get a bye for being first runner up, I should have been able to get one in the past because I was three times King. So as they go by they are making their rules to suit their vibes, and the thing is me saying that today, is just to let people remember," Dice said.